This bobble head Irish Santa Claus centerpiece features a pot of gold and a shamrock. 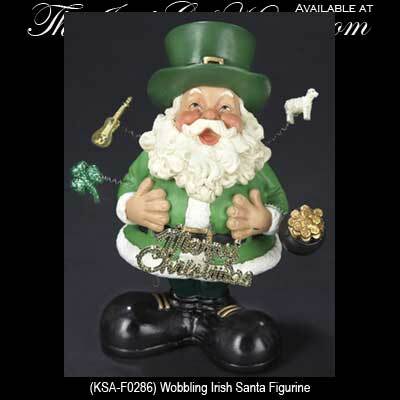 This festive Irish Santa is a bobble head figurine and he features spring loaded pot of gold and a shamrock along with a lamb and a guitar. The bobble head Irish Santa is also holding a sign that says Merry Christmas. The bobble head figurine stands 6 1/2" tall and is made of porcelain and fabriché by KSA. The Irish Santa will make a splendid decoration at Christmas or may be displayed all year long. The Christmas centerpiece is gift boxed with a shamrock history card that is complements of The Irish Gift House.